The Right Honourable Robert George Brian Dickson, P.C. View image details of the Rt. Hon. Robert George Brian Dickson, P.C. Robert George Brian Dickson was born in Yorkton, Saskatchewan, on May 25, 1916. He was the son of Thomas Dickson and Sarah Elizabeth Gibson. After his family moved to Winnipeg, he attended the University of Manitoba and graduated with an LL.B. in 1938. He worked for two years in the investment department of the Great-West Life Assurance Company, then was called to the bar in 1940. Before practising law, he enlisted in the armed forces during the Second World War and served overseas, where he was severely wounded in 1944. Upon his return to Winnipeg in 1945, he joined the law firm of Aikins, Loftus, MacAulay, Turner, Thompson & Tritschler. He also lectured at the Faculty of Law of the University of Manitoba for six years, until 1954. In 1963 he was appointed to the Court of Queen's Bench of Manitoba and four years later was elevated to the Manitoba Court of Appeal. He was appointed to the Supreme Court of Canada on March 26, 1973 and became its chief justice on April 18, 1984. He served on the Supreme Court for 17 years before retiring on June 30, 1990. 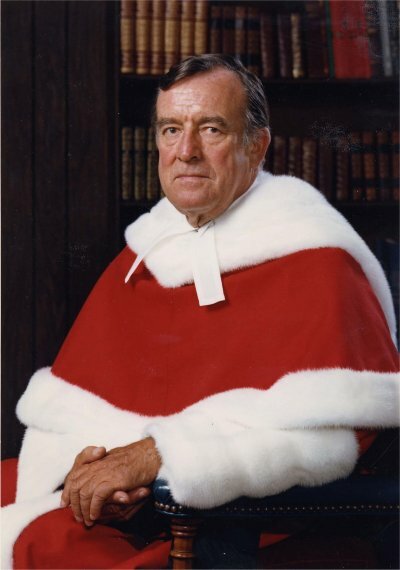 Chief Justice Dickson died on October 17, 1998, at the age of 82.